Snow might be a big part of the Canadian identity, but that does not mean that you want to spend your winter months getting rid of it. Fresh snowfall might look beautiful but it can create a relative obstacle course for yourself and any visitors that you might have. When you want to keep your space clear and passable without the headache and back pain to go with it, call a Gorilla! If Canada is known for anything, it is more than likely winter. All over Canada, the first snowfall is celebrated but after that, snow fall can get out of control. If you are finding yourself held back by the amount of snow falling on your property, get mobile again with our Brampton snow removal and salting service. On average, the Brampton area sees more than four feet of snow annually. 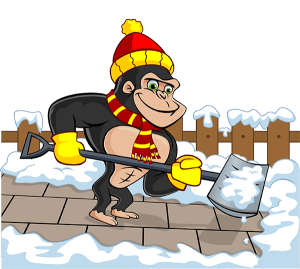 Instead of wading through snow up to your chin, organize a routine Brampton snow removal and salting service to keep your path clear. Whether you need a clear path to your home, storefront or workspace, our Brampton snow removal and salting can be made to fit your space. Temperatures throughout the day can be unpredictable. You might bundle up in the morning only to be sweating in the afternoon. In the same way that you take off layers to accommodate the heat, the ice that has built up around your property does the same. As ice melts throughout the day, it re-freezes over night and creates a dangerous slipping hazard. Simply throwing down ice is not enough to keep those slips and falls at bay. 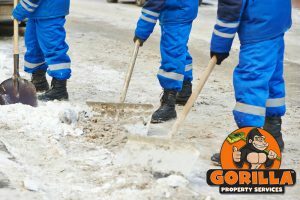 Luckily, our Gorillas know how to treat all those tricky areas around your property in order to provide you with a safe environment.